Japanese nursing homes are using Doppler radar, virtual reality goggles and ultrasonic sensors strapped to patients’ abdomens to reduce healthcare costs. Welcome to the future. Eldercare is a pressing issue for the island nation. Nearly a third of Japan’s citizens will be older than 65 by 2025. According to a Wall Street Journal story, government and businesses are embracing IT as the solution. 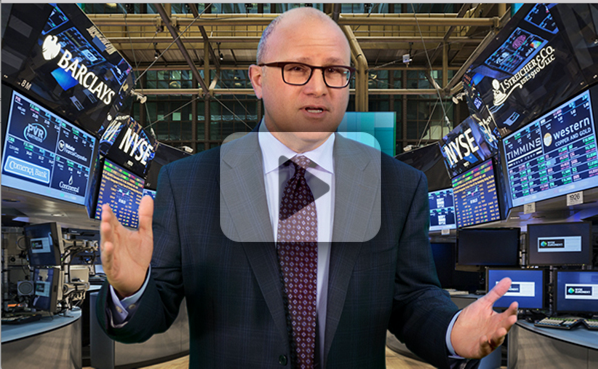 It’s a trend that investors everywhere should be watching. Huge growth is inevitable. The Organization for Economic Cooperation and Development, a worldwide trade body, reports that healthcare costs in Japan currently represent 10.7% of gross domestic product. 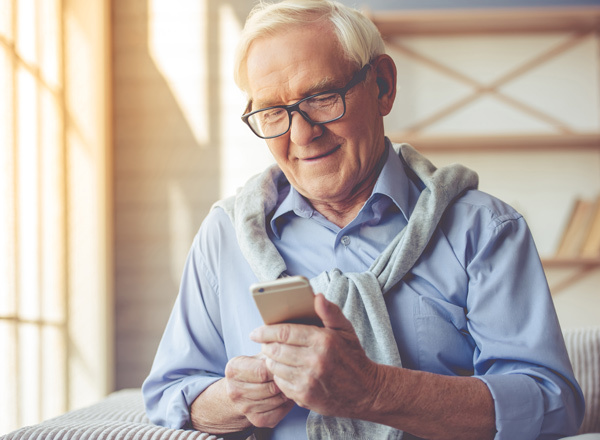 The bill for eldercare is expected to reach $298 billion within six years. For comparison, healthcare consumed 17.2% of GDP in the U.S. during 2018. Something has to give, soon. Aging populations, and steadily rising healthcare costs, have the potential to bankrupt many of the world’s developed economies. The oddity is most other parts of the global economy have been disrupted by digital technologies. Robots connected to cloud computing networks stamp, weld and assemble automobiles. Others mine iron ore and drill for oil. The schedules of trains, planes and urban mass transit systems are dictated by software algorithms. And vast media libraries have been reduced to bits of code we stream on smartphones. Digital transformation has brought huge productivity gains, and reduced costs to every part of the global economy except healthcare. That will change. Deep Mind, an artificial intelligence company owned by Google, teamed with Britain’s National Health Service in 2016 to build a smartphone application to alert patients at risk for kidney failure. Today, the AI-focused company is working with several NHS research hospitals, applying analytics across huge swaths of anonymized patient data to better understand disease and effective treatment methods. In the European Union, doctors in Sweden, Denmark, and Estonia zip electronic prescriptions to patients or pharmacists directly. Austrian physicians, nurses and clinicians are able to pull up patient records through a national electronic health record system. A 2018 research study from McKinsey and Co., the global IT consulting firm, and the German government, found that digitization would have resulted in $39 billion in savings, or 12%, during the calendar year. Bain & Co., a major management consulting firm, is trying to bring disruptive digital technologies to health insurance companies to save billions. The Massachusetts adviser wants insurers to build infrastructure for electronic medical records, then process that data using machine learning and advanced data analytics. Analysts also recommend digital ledger systems to protect patient data, and Internet of Things and virtual reality strategies to reduce costs. This vision is already playing out in Japan. Tatsuya Takahashi formed Z-Works in 2015, a patient monitoring software company. After securing start-up capital from Canon, the company partnered with Sompo Holdings, the third-largest insurance company in the country. At a Sompo-owned nursing home outside Tokyo, patients and their rooms have been equipped with sophisticated Doppler sensors to monitor breathing and heartbeat. Other devices monitor falls and even incontinence. Z-Works software sends all of this data to nursing stations and caregivers wearing wireless earbuds. At a rehabilitation center, stroke patients wearing VR goggles grab at imaginary superimposed monsters, and catch balls. Gamification makes exercise fun for the patients. It also negates the need for individual therapists. 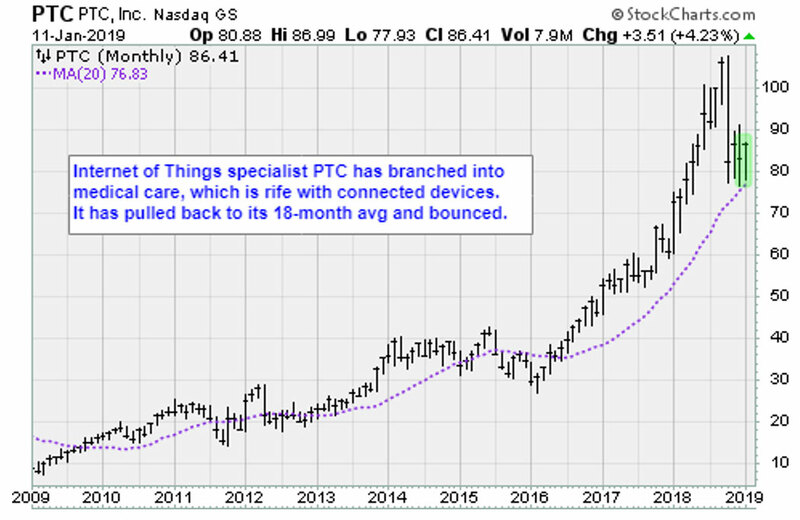 PTC Inc. (PTC) is a global computer software company. Founded in 1985, the Boston company became an IoT pioneer. Although the company is renowned for its industrial IoT applications, the tides have begun to shift. There is real progress being made in healthcare. Additionally, the Medicare program in the United States will begin paying doctors on the basis of quality of care, rather than visits. This will incentivize healthcare organizations to invest in systems of sensors, patients, caregivers and software. The result should be more sensors and more virtual care. 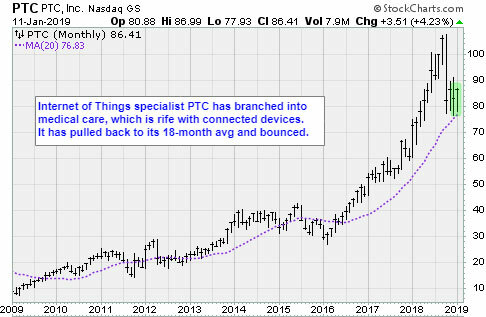 PTC shares trade at 33x forward earnings, for a market capitalization of $10.2 billion. Its software is considered best in class. Sales grew 6.8% in fiscal 2018 to $1.2 billion. Most economies are struggling with rising healthcare costs. PTC has a solution. Consider buying the shares into weakness.